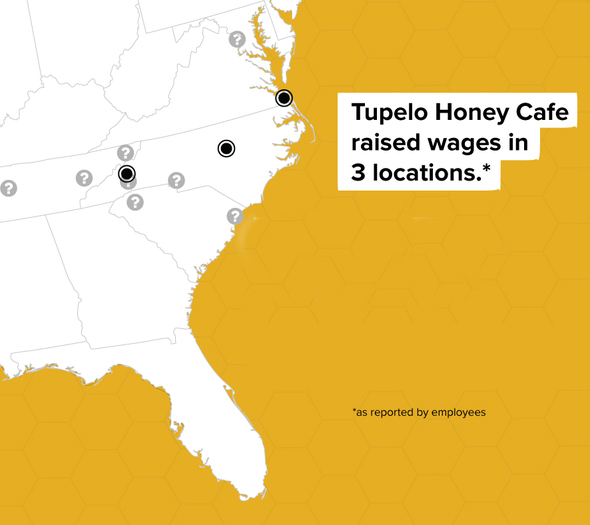 As of today, Tupelo Honey Cafe has raised the wages of support staff in their downtown Asheville, Raleigh and Virginia Beach locations back to $5.15 per hour. I’m incredibly proud of the success of this campaign and more than ever, I am convinced of the power working people have when they stand up and work together to demand more. When it comes to workers’ rights, I believe we have to take power and create voice – those things are not handed to us. Food service activism is on the rise, though addressing workplace conditions within the restaurant industry is a fairly new phenomenon. My hope is that our small victory is one of thousands of small victories that ultimately will change the way workers view their ability to speak up and shape their working conditions. Reinstate support staff (formerly known as bussers’) wages to their previous levels. Tupelo Honey Cafe is synonymous with the idea of Southern hospitality. There are always biscuits on the table and your sweet tea glass is never empty. In fact, the restaurant is so hospitable that within 5 years it’s been able to open 10 new locations across the Southeast and has announced plans to expand beyond the region and double locations over the two years. However, patrons might not know that this growth has come at a personal cost for employees. Tupelo Honey Café employees know that with growth comes change. We have absorbed our fair share of change. From eliminating free food while working to scrapping incentive based pay raises for tipped employees, it’s getting harder and harder to feel like a valued member of the team. We have also watched as our company pads its profit margins and expands the brand on the backs of the lowest paid employees and their families. Over the past couple of years, corporate management decisions have diminished the reasons we loved working for this company. Support staff (bussers/back servers) are an essential part of any well-organized and profitable restaurant. They provide support and heightened efficiency, allowing wait staff to give personal and professional service. In the summer of 2014 the company chose to maximize profits and drastically cut wages for support staff -- who used to be called bussers -- by over $3/hour. Not only does this mean that some of these support staff can no longer pay the bills or keep food on the table, but servers themselves are having a harder time making sure the customers at the table are happy too. Alia, a bartender, is a working mom and the main breadwinner of her household. Halley, a server, is a college student supporting herself while working towards her degree. When support staff is not compensated fairly, it has the ripple effect of increasing the number of servers, thereby reducing earning potential for all front of the house staff. That’s hundreds of dollars each week that could go towards paying bills and buying groceries. All we are asking is that Tupelo Honey live up to their own standards and reinstate the wages of support staff (technically called back servers) to their original levels of $5.15 per hour. Right now it is a company wide wage policy for back servers to be paid a federal minimum meant for servers ($2.13 per hour). This base wage for support staff is below local and national industry standards. If you want to "hire the best people in every position", you have to be sure those people can earn a living. Good food shouldn’t just be about the bottom line — it’s about fellowship, service and always having a seat at the table. Join us if you would like to see Tupelo Honey put its own values into action by reinstating wages for support staff. I work in the restaurant industry and know of discrepancies as well. Big news! Alia has confirmed that the South Asheville location has also raised wages. This victory keeps getting even sweeter.